We’ve been a big fan of 4moms products since Maddie Grace was a newborn. The first thing we had was the Infant Tub, followed quickly by the mamaRoo – both of these we loved having those first months with Maddie Grace and I recommend to all new moms. We still use our Sprout on a nightly basis for bath time. 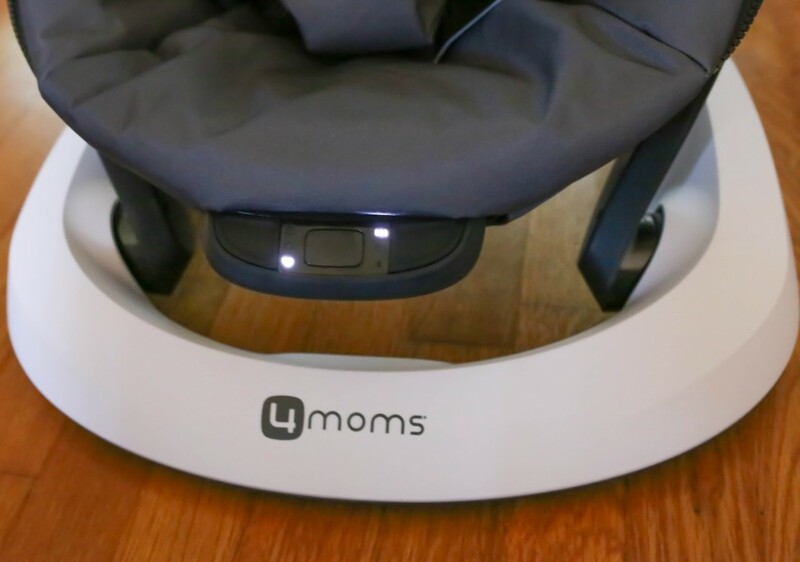 Now that our new baby will be here soon (and I just realized it’s less than a month from my due date eek) I figured it was time to add to our collection with a 4moms bounceRoo and I thought I would share my BounceRoo review with all you moms out there! 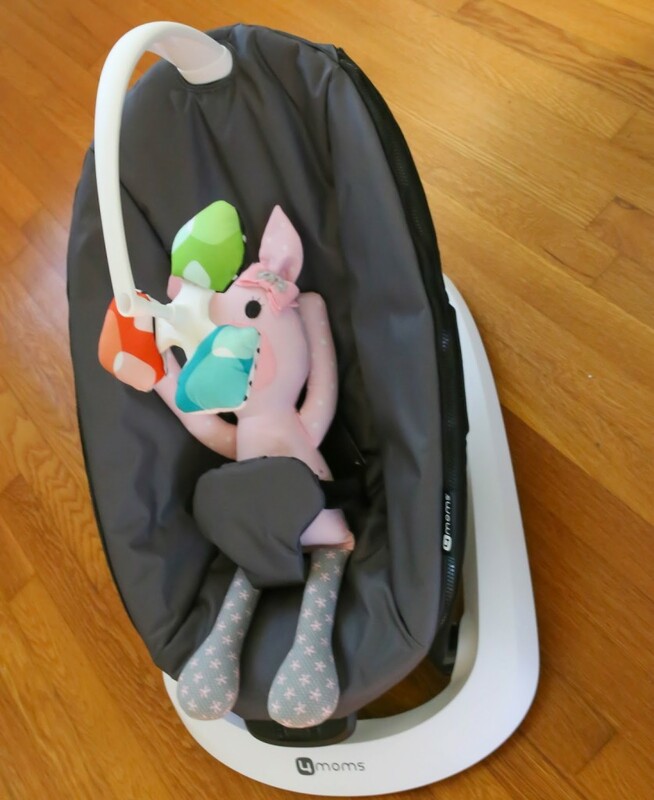 Where I loved our mamaRoo with Maddie Grace and definitely plan to use it again [it was a lifesaver] it was hard to move around the house because of the size and sometimes Maddie Grace slept better in a little seat we had that just vibrated. But that seat was one of those cheesy looking baby seats. 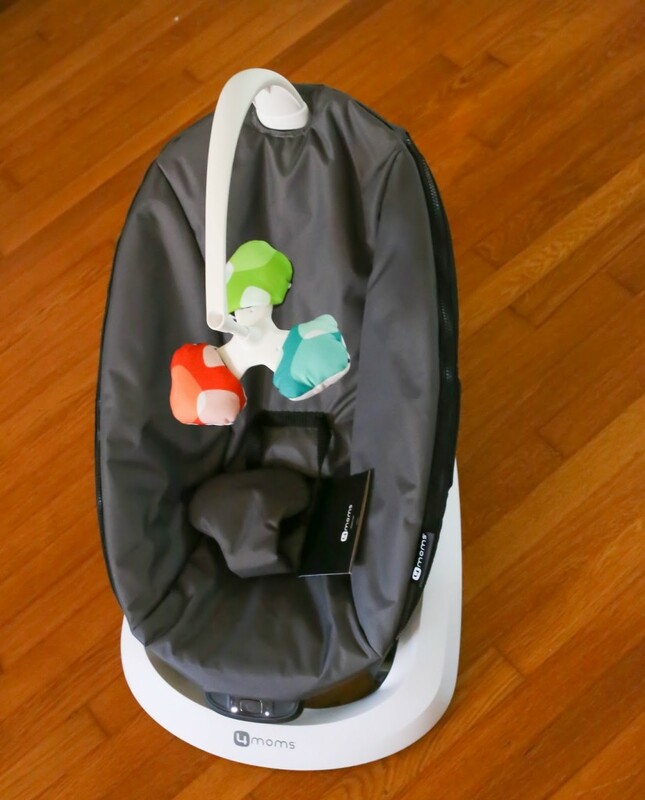 This is what led me to look into the bounceRoo – which is more of a traditional bouncing baby seat but one that is very aesthetically pleasing and modern. It looks sleek and looks good in any room of the house. Then there’s the size. The bounceRoo is perfect for throwing in the kitchen when everyone is sitting around the breakfast table, or in the living room while watching TV, it will fit into our play room while I’m busy with Maddie Grace, and even in our bathroom if I ever find time to shower when the baby gets here. It’s incredibly lightweight (approximately 6 pounds) so moving it back and forth between these rooms, even while carrying a newborn and chasing a toddler, is easy! It’s also easy to fold up compactly for taking on trips! 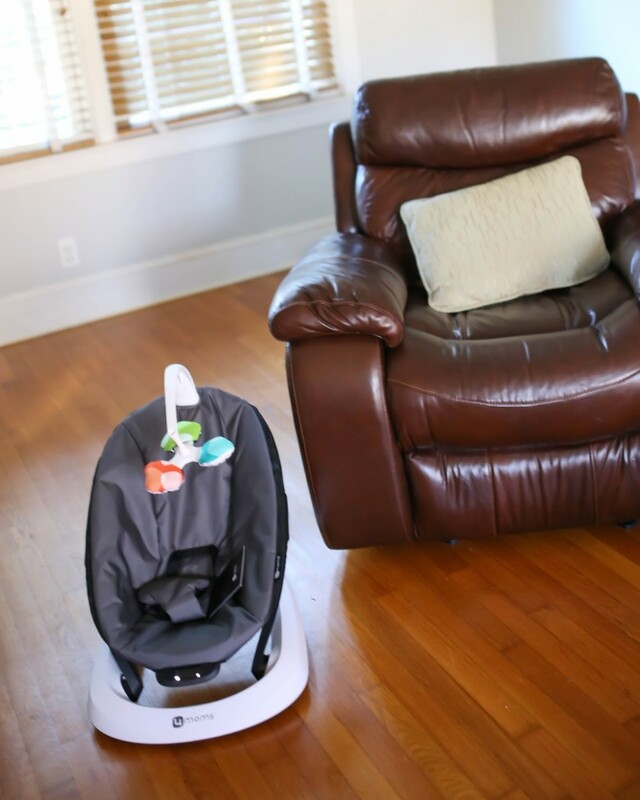 The bounceRoo is made to bounce while your baby moves to create a natural bouncing motion that calms and soothes your baby. On top of this it has 3 vibration modes: heartbeat, wave, and bee, each with 3 intensity settings, that shut off automatically after 20 minutes. It also features an overhead toy mobile with 3 reversible balls – black and white on one side for the earliest newborns that you can flip to color when their eyesight improves. The 3 point safety harness seems snug and secure for keeping baby safe. I also love that the seat cushion, which seems plush and comfy, zips off for easy washing, because we know how messy newborns can be. I can’t wait to have a newborn in our 4moms bounceRoo in just a few short weeks! What are some of your favorite features from my 4moms bounceRoo review? What were some of your favorite products to have on hand for a newborn? I’d love to hear more below! We are HUGE 4moms fans in our home. We had the mamaroo when my son was a newborn and it was a life saver. He loved it and I may have cried a bit when he grew out of it. Their products are amazing. Next baby I'm hoping to pick up a few more. I've been eying the stroller. A friend of mine has the stroller and it is awesome! I never had any 4moms products, I didn't have any room for more stuff! Might have to try this out when baby comes, though I'm pretty partial to my swing. That thing saved my life the first time around! This is such a great chair for the little ones. I've had my eye on it! We actually never had a swing for Emerson. Crazy, I know. We'll see what happens with baby number 2 [eventually]. We had a bunch of little seats around the house haha! She was so colicky and the motion/vibration really helped! Funny how all babies are different!